It’s impossible to talk about one particular Hunger Games book or movie without talking about the others. After all, it’s just one big story, one big novel, one big movie, broken up into smaller parts. You can like one novel or film more than the other, but it’s not the style that’s changing, it’s the content; what you’re enjoying or not enjoying is what happens to be occurring during that particular timeline. I read the books in quick succession, probably favoring the second just because it had the coolest action, the most background, and it was the start of the revolution. And so far the movies have struck me the same way; I liked Hunger Games, I liked Catching Fire a little more, and now I’ve finally watched Mockingjay Part 1. It’s the beginning of the dark end of the adventure, a time for more introspection and less action. And while that’s all well & good, I hope Part 2 picks up the pace a bit. Don’t read this summary if you haven’t read/watched the first two; it’s necessarily a giant spoiler. We know all about Katniss, her sister, Panem, the Games, the way her & Peeta survived the arena, their fame, and how much the Capital hates them. Then the 75th anniversary, another round of action, and District 13 revealed. 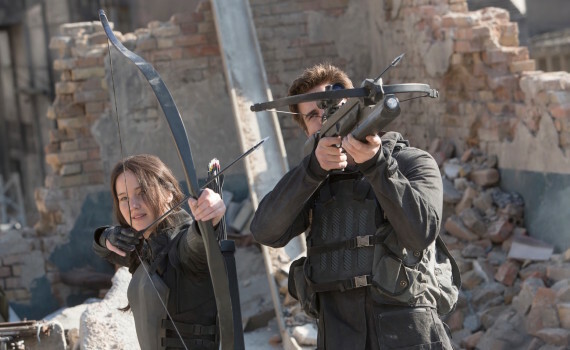 When this film begins, Katniss has been rescued after she destroyed the arena, the Rebels are beginning their war against the Capital, but Peeta is a prisoner and seems to have switched sides. The Rebels need Katniss as their symbol, their Mockingjay, but she can’t wholly commit to this charade without Peeta, the brain behind all their playacting, and the real reason the Districts love their heroine. But Peeta is in the lion’s den, life goes on, and Katniss & her best friend Gale must figure out a way to get the Districts to rally behind 13 while the fire of revolution is still catching. After the first movie where the story is revealed, the characters created, and the Games established, the second film was able to go full blown action, though it stopped short of going over-the-top because of the fairly excellent back story created by the author. The problem with the third is that the action takes a break, the story darkens, and we lose a little of the tween excitement that we both love & hate. Jennifer Lawrence is called upon to step up and show her emotional side, and she does that pretty well, better than she did in the second film, which I thought was her weakest. Perhaps she was helped by a strong cast around her; Philip Seymour Hoffman, Julianne Moore who I usually hate, Liam Hemsworth, a touch of Woody Harrelson. The cast combined to make a believable tale, even if it wasn’t overly exciting. You can tell that this storyline was only a small part of book three and that it didn’t necessarily need its own film, but at least they didn’t take a Hobbit approach and make up 80% of the content. They stuck to the script, depressed us a little, but actually piqued my interest for the last film, one I think will be a step up from this one, which was a step down from #2.